aFrom the Department of Neurosurgery, Changhai Hospital, Second Military Medical University, Shanghai, P.R. China. BACKGROUND AND PURPOSE: The Tubridge flow diverter is a novel device developed in China and aimed at reconstructing the parent artery and occluding the aneurysm. We conducted this study to evaluate its feasibility, safety, and efficacy for the treatment of large or giant internal carotid artery aneurysms, which are still challenging with conventional therapy. MATERIALS AND METHODS: The clinical and angiographic data of 28 patients with 28 large or giant internal carotid artery aneurysms treated with Tubridge flow diverters were prospectively collected and analyzed. RESULTS: Thirty-three Tubridge flow diverters were successfully implanted except for 1 poor midstent opening; the result was a technical success rate of 97.0% (32/33). Follow-up angiographies were available for 25 aneurysms; the mean follow-up was 9.9 months (5–24 months). Of the 25 aneurysms, 18 (72.0%) were completely occluded, 6 (24.0%) were improved, and 1 (4.0%) was unchanged. All of the visible covered branches and parent arteries were patent, with no stenosis or obliteration. During a follow-up of 6–30 months (mean, 19 months), symptoms were resolved in 13 patients, improved in 6 patients, and unchanged in 4 patients. Five patients experienced transient clinical deterioration due to a postoperative increased mass effect. Procedure-related morbidity and mortality were both zero. CONCLUSIONS: Our preliminary experience shows that the Tubridge flow diverter is a safe and effective tool for treating large and giant internal carotid artery aneurysms. However, multicenter randomized trials and studies involving a long-term follow-up are necessary. The Tubridge is a new type of flow-diversion (FD) device developed by MicroPort Medical Company (Shanghai, China) on the basis of our previous hemodynamic studies of intracranial aneurysms,6 aimed at treating complex aneurysms that were difficult to access via clipping or conventional endovascular treatment, such as large and giant aneurysms, and providing more treatment options for neurointerventionalists and neurosurgeons. After demonstrating its efficacy and safety in animal experiments,7,8 we obtained the consent of the Ethics Committee and China Food and Drug Administration to initiate the present prospective clinical trial, aimed at evaluating its feasibility, safety, and efficacy for the treatment of large or giant internal carotid artery aneurysms. After obtaining approval from the Ethics Committee and China Food and Drug Administration, we conducted this prospective study. The inclusion criteria for Tubridge flow-diverter placement were as follows: 1) The subject understands the nature of the procedure and provides written informed consent; 2) the subject is willing to return to the investigational site for the 30-day and 6-month follow-up evaluations, at least; 3) the subject is 18–75 years of age; 4) the subject has ≥1 wide-neck aneurysm (neck diameter of ≥4.0 mm or dome/neck ratio of ≤1); 5) saccular aneurysms are ≥10 mm; 5) the diameter of the parent artery is 2.0–6.5 mm; and 6) the internal carotid artery aneurysm is unruptured. Aneurysms that were ruptured, dissecting, or comorbid with other intracranial diseases were excluded. Recanalized large or giant aneurysms were also included in this study. Therapeutic alternatives, including conventional endovascular treatment or flow-diversion treatment, were considered by the authors of the present article to determine the most appropriate course of treatment. Written consent was obtained from each patient. Overall, 28 patients with 28 large or giant aneurysms were recruited between August 2010 and August 2012 (2 patients had multiple aneurysms, which were located at the opposite side of the target aneurysms, and were not included in this study). The group comprised 8 men and 20 women; the mean age was 54.8 years (range, 20–73 years). The clinical presentations of these patients varied and included no symptoms (n = 6), headache (n = 11), recanalization (n = 3), oculomotor paralysis (n = 7), blurred vision (n = 3), blindness (n = 1), and amenorrhea (n = 1). Endovascular treatments were performed by 2 authors of the present article (J.-M.L. and Q.-H.H), each of whom has >10 years of experience in intracranial stent placement. Of the 3 recanalized aneurysms, 1 case was treated with coils alone, and the remaining 2 cases were treated with stent-assisted coiling with either Neuroform (Stryker Neurovascular, Fremont, California) or LEO (Balt Extrusion, Montmorency, France). Locations of the 28 aneurysms were defined on the basis of the segment of the ICA (according to the classification of Bouthillier et al9) where the aneurysm necks were found. Thus, 1 of the 28 aneurysms was located at the petrous segment (the ICA within the carotid canal), 10 were located in the cavernous segment (the ICA from the superior margin of the petrolingual ligament to the proximal dural ring), 7 were located in the paraclinoid segment (the ICA that begins at the proximal dural ring and ends at the distal dural ring where the ICA becomes intradural), 8 were located in the ophthalmic segment (the ICA that begins at the distal dural ring and ends just proximal to the origin of the posterior communicating artery), and 2 were located in the communicating segment (the ICA that begins just proximal to the origin of the posterior communicating artery and ends at the ICA bifurcation). The size of the aneurysms ranged from 11.3 to 44 mm, and the mean size was 21.6 mm. The aneurysms were further classified according to size as large (10–15 mm; n = 4), very large (15–25 mm; n = 16), or giant (≥25 mm; n = 8). The diameters of the proximal parent arteries ranged from 3.6 to 5.8 mm. As described above, 3 aneurysms had been treated with coiling or stent-assisted coiling before, while the others were all treated for the first time. The Tubridge flow diverter is a braided, self-expanding stentlike device with flared ends. Current Tubridge flow diverters are available in various diameters (2.5–6.5 mm) and lengths (12–45 mm). The large Tubridge (diameter, ≥3.5 mm) is a braid of 62 nickel-titanium microfilaments and 2 platinum-iridium radio-opaque microfilaments; the small Tubridge (diameter, <3.5 mm) is composed of 46 nitinol and 2 platinum-iridium microfilaments. All Tubridge flow diverters were designed with a pore size of 0.040–0.050 mm2 at the nominal diameter to provide high metal coverage (approximately 30.0%–35.0%) at the aneurysmal neck after full opening. The Tubridge is mounted to a delivery wire and constrained within a removable sheath. The tip of the delivery wire is J-shaped, which is designed to help prevent vascular endothelial cell injury and to facilitate microcatheter removal through previous devices and to deploy a second flow diverter. During the implantation procedure, a Tubridge-compatible standard 0.029 inse diameter (ID) microcatheter was placed in the distal segment (approximately 30 mm) of the aneurysm neck with the assistance of a microwire. Then the Tubridge flow-diversion device was introduced via the microcatheter into the target zone. Manipulation during releasing resembles that in Silk flow diverters (Balt Extrusion). After we placed the Tubridge into position by pushing the delivery wire and simultaneously withdrawing the microcatheter, the device began to expand in the artery and was deployed. To increase the proportion of metal coverage at the aneurysm neck, we deliberately pushed the microcatheter toward the aneurysm neck while the aneurysm neck was partially covered by the stent. Generally, the shortening rate after complete deployment of the Tubridge is approximately <50.0%, depending on the size of the Tubridge relative to the vessel and any discrepancies between the proximal and distal vessel diameters. There is a marker in the middle of the Tubridge; the device can be retracted until released to that point. After one deploys the first one, a second flow diverter would be considered if a disturbed inflow jet was not observed. Each patient received systemic heparin after the placement of the sheath. The activated clotting time was maintained at 2–3 times the baseline throughout the procedure. Each patient received dual antiplatelet drugs (300 mg/day aspirin plus 75 mg/day clopidogrel) for at least 3 days before the procedure. A postoperative antiplatelet regimen was administered as follows: <6 weeks: 300 mg aspirin + 75 mg clopidogrel; 6 weeks to 3 months: 100 mg aspirin + 75 mg clopidogrel; ≥3 months: 100 mg aspirin indefinitely. According to our protocol, each patient was clinically evaluated at discharge and prescribed follow-up assessments at 1, 3, and 6 months posttreatment and yearly thereafter. An angiographic evaluation consisting of digital subtraction angiography was performed immediately after the procedure, at 6 months posttreatment, and yearly thereafter. For aneurysms treated with the Tubridge flow diverter plus coils, the angiographic results obtained immediately after the procedure were classified according to the Raymond classification system. For aneurysms treated with the Tubridge alone, flow modifications were defined as disrupted inflow jet, slow flow (if the contrast circulation within the aneurysm became slower), or reduced contrast filling (if increased contrast stagnation was observed within the aneurysm at the late venous phase of the angiographic series).10 At follow-up, the angiographic results were independently interpreted by 2 experienced neurosurgeons who were not involved in this study and compared with the initial results to determinate whether the aneurysms were completely occluded, improved, stable, or recanalized. Branches that were covered by flow diverters were examined to confirm patency. Each patient's clinical symptoms were evaluated and recorded as completely/partially relieved or worsening. The characteristics of the 28 patients treated with Tubridge flow diverters, including demographic information, clinical presentation, morphologic features of the aneurysms, treatment results, and follow-up data are summarized in Tables 1 and 2. Tubridge delivery was successful in all 28 patients. Thirty-three Tubridge flow diverters were implanted, all of which had a large (diameter, ≥3.5 mm) braid of 64 microfilaments. For 5 aneurysms, 2 overlapping flow diverters were deployed, while the remaining 23 aneurysms were treated with a single flow diverter. No obvious difficulties with device delivery or deployment were encountered, and the amount of friction associated with the delivery was comparable with that of Enterprise stents. However, poor midstent opening was identified in 1 patient (1/33, 3.0%) with an aneurysm in the cavernous segment of the internal carotid artery and a remarkable tortuous parent artery. We attempted to expand the poorly opened stent with a microballoon; however, delivery of the microcatheter though the stent proved to be difficult, and the attempt was abandoned. Fortunately, this patient experienced no untoward effects of the procedure, and close clinical observation was arranged (Fig 1). Right internal carotid artery digital subtraction angiography (A) revealed a 13-mm wide-neck cavernous segment aneurysm. A Tubridge flow diverter was deployed into the parent artery, aimed at covering the aneurysmal neck, but postoperative DynaCT revealed that the flow diverter was not fully opened (B, white arrow). Cross-sectional image (C, white arrow) and 3D reconstruction (D, white arrow) show poor opening of the device. Fortunately, 18-month follow-up angiography reveals that the aneurysm is stable with a patent artery (E). For the 18 aneurysms treated with a flow diverter and coiling, the immediate angiographic results included neck remnant in 2 aneurysms and sac residue in the remaining 16 aneurysms. For the 10 aneurysms treated with a flow diverter alone, disrupted inflow jet and slow flow were observed in each patient except for the 1 patient with a poor midstent opening; flow reduction was observed in 7 aneurysms (reduction of <50.0% in 5 patients, reduction of ≥50.0% in 2 patients) (Fig 2), and the remaining 3 aneurysms exhibited no obvious change (1 was due to poor midstent opening as described above). In total, there were 27 visible branches covered by the Tubridge, including 23 ophthalmic arteries, 2 meningohypophyseal trunks, 1 early frontal branch (in this case, the A1 segment was absent, and the distal part of the Tubridge was deployed into the middle cerebral artery), and 1 posterior communicating artery, all of which were patent following Tubridge deployment. 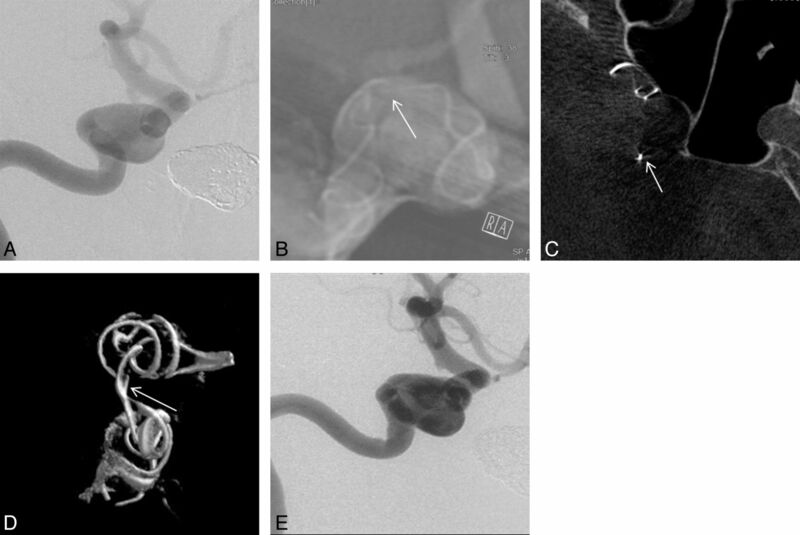 Right internal carotid artery digital subtraction angiography and 3D reconstruction (A–C) reveal a giant cavernous segment aneurysm of approximately 25.3 mm. The microcatheter is delivered across the aneurysmal neck (D), and 1 Tubridge flow diverter is deployed. Postoperative angiography reveals a disrupted inflow jet, slow flow, and flow reduction (E and F). The 23-month follow-up angiography reveals that the aneurysm is completely occluded (G). H, The black arrow points to the patent covered ophthalmic artery during follow-up compared with the preoperative image. MR imaging follow-up shows shrinkage of the aneurysm (black arrow). In all 28 patients, neither ischemic nor hemorrhagic complications occurred. During the follow-up period of 6–30 months (mean, 19.0 months), symptoms were resolved in 13 patients (4 cases of oculomotor paralysis, 9 headaches), improved in 6 patients (3 cases of oculomotor paralysis, 1 case of blurred vision, 2 headaches), and unchanged in 4 patients (2 cases of blurred vision, 1 case of blindness, and 1 case of amenorrhea). Five patients experienced transient clinical deterioration due to a postoperative increase in mass effect. Of these 5, three had moderate headache within 2 weeks after the operation, and 2 experienced worsening oculomotor nerve paralysis within 3 months of the procedure. However, all of these symptoms had resolved by the last follow-up. Thus, there were no instances of procedure-related morbidity or mortality. Twenty-five patients with 25 aneurysms completed a least 1 follow-up cerebral angiography; the remaining patients were unwilling to undergo angiographic follow-up for various reasons. The follow-up periods ranged from 5 to 24 months (mean, 9.9 months). Eighteen of the 25 (72.0%) aneurysms for which follow-up data were available were completely occluded, whereas the 6 (24.0%) in which only a neck remnant was observed (Fig 3) were improved, and 1 (the case in which the stent did not fully open) remained unchanged. Detailed outcomes of aneurysms treated with “FD alone” and “FD plus coiling” are shown in Table 3. In the “FD alone” group, the complete occlusion rate was 75.0%, while that in the “FD plus coiling” group was 70.5%. On the angiograms, parent arteries of all cases were patent, and there was no evidence of intimal hyperplasia or in-stent stenosis. All of the visible covered branches were patent without stenosis or obliteration. Left internal carotid artery digital subtraction angiography of an aneurysm treated with a Tubridge flow diverter combined with coils, which results in partial occlusion of the aneurysm (A). DynaCT reconstruction reveals full opening of the flow diverter (B).The 18-month follow-up angiography reveals that the aneurysm has improved, and only a neck remnant is observed (C, black arrow). In the present article, we report preliminary findings related to the application of Tubridge flow diverters in large or giant ICA aneurysms. Despite the complex morphologies of these aneurysms, the short-term results are satisfactory, with a high technique success rate and minor technique/clinical complications. The Tubridge is actually a stentlike vessel-reconstruction device designed with a high metal coverage rate and low porosity. It diverts blood flow away from the aneurysm while preserving normal blood flow of the side branches. Except for the use of a nickel-titanium alloy (commonly known as nitinol, which exhibits shape-memory and superelasticity) and flared ends, the Tubridge offers multiple structural improvements over the Pipeline Embolization Device (Covidien, Irvine, California) and Silk flow diverters (Table 4). The platinum-iridium material used for the radio-opaque microfilaments improves the visualization of both the diameter and the length during the placement procedure. More important, the use of more braided microfilaments for the large-size flow diverter decreases the shortening rate of the flow diverter after full opening and offers more appropriate pore attenuation compared with the 48-wire design of the Silk or Pipeline flow diverters. Similarly, the recently introduced Surpass flow diverter (Stryker Neurovascular) was also designed with different structures: The 2.5-mm-diameter device has 48 wires, whereas the 3- and 4-mm devices have 72 wires and the 5-mm device is constructed of 96 wires.11 Moreover, their users experienced neither the complications of device migration nor incomplete neck coverage due to device shortening as reported in early series.10,12 We believe that these structural improvements combined with extensive operator expertise (both of our operators had practiced the delivery and deployment of the Tubridge on models and gained full knowledge of the Tubridge characteristics before placing it in humans) reduced the chance of technical adverse events in patients treated with FD. In theory, a flow diverter can promote healing in aneurysms without additional coiling. However, coils were introduced into the aneurismal sac simultaneously with flow diverter placement in 18 aneurysms of this series. This was done to help the microcatheter cross the neck of extremely wide-neck aneurysms and/or to promote aneurysm thrombosis to prevent early or delayed aneurysm rupture.20 Additionally, for extremely wide-neck aneurysms, coils may provide good support for implanted flow diverters and help stabilize a flow diverter during deployment. Otherwise, flow diverters may protrude into the aneurismal sac due to the impact of blood flow. Although various articles have reported promising results from treating aneurysms with FD, increasing questions have arisen about this type of treatment. In some prospective studies13,16,18,19,21⇓⇓⇓⇓–26 and series with large numbers12 of the Pipeline and Silk devices, the periprocedural complication rate has been reported to generally range from 2.8% to 11%, with a rate of ischemia and SAH/intracerebral hemorrhage ranging from 0.9% to 7.7% and 0% to 6.6%, respectively. Delayed complication rates of ischemia, bleeding, and mass effect were reported to be 0%–11.5%, 0%–4.7%, and 0%–23%, respectively. The overall morbidity and mortality associated with Pipeline and Silk in these studies were 0%–15% and 0%–6.6%, respectively. Ischemic complications are generally due to intrastent thrombosis and/or side branch occlusion. However, intrastent thrombus formation and subsequent parent artery occlusion were always related to poor stent opening.12⇓⇓⇓⇓–17,26 Resistance to antiplatelets is another possible reason; however, for patients with full opening of the stents, the ischemic event rate was not reported to be higher than that for the self-expansion stent,12⇓⇓⇓⇓–17,26 though the dose of dual antiplatelet medicine varied in different articles. To date, most side branch occlusion events have been reported to occur in patients who are treated with more than 2 flow diverters or stents: Szikora et al22 reported 2 cases of ophthalmic artery occlusion, in which the number of flow diverters implanted was either 3 or 4. One patient in the Pipeline Embolization Device for the Intracranial Treatment of Aneurysms Trial experienced lenticulostriate occlusion after the implantation of 2 Pipeline flow diverters and 1 Neuroform stent.21 In our series, only 1 instance of poor stent opening occurred, which did not lead to occlusion of the parent artery. Moreover, we did not encounter any other periprocedural or delayed ischemic events by using the present antiplatelet regimen. To ensure subject safety in our series, we implanted no more than 2 flow diverters into any single parent artery. In addition, manipulation of the microcatheter and FD can help decrease the metal coverage rate on the aneurysmal neck and minimize the impact of diversion on the intact vessels and perforators. No visible side-branch occlusions were noted in the present series. Another severe complication associated with flow diverter implantation is intracranial bleeding. Although the exact reason is unknown, some authors believe that increased intrasaccular pressure and unstable thrombus formation may be involved.20,27 On the basis of reports of these events, the Balt Extrusion Company released an urgent safety notice in 2010, which advised that coils be used in combination with Silk implantation. However, in the present series, we did not encounter any hemorrhagic complications. This outcome may be due to the implantation of additional coils for selected aneurysms. Additional coils may promote thrombi formation in the aneurysm sac and decrease the risk of aneurysm rupture. However, the low rates of hemorrhagic events observed in the present study may be due to biases associated with small sample sizes. 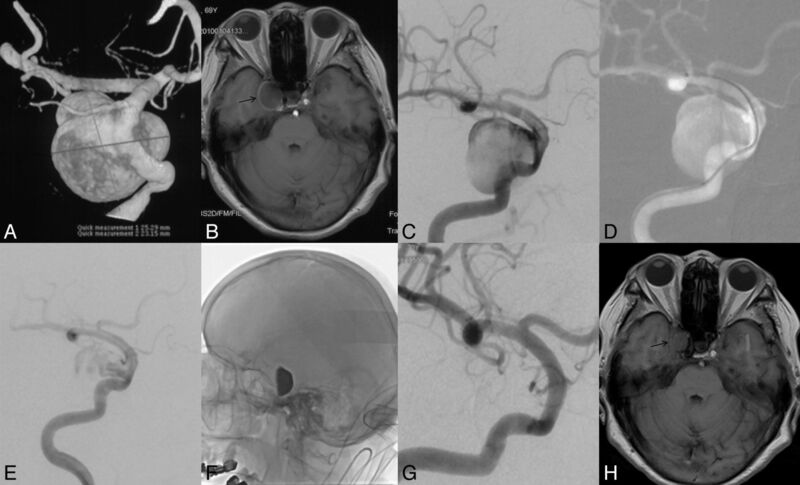 The necessity of additional coil embolization is under review by various randomized clinical trials such as the Efficacy Trial of Intracranial Aneurysm Treatment Using Two Different Endovascular Techniques.28 A multicenter prospective trail comparing Tubridge flow-diverting treatments with Enterprise stent-assisted coiling, which is also being conducted in China (registered on the Chinese Clinical Trial Registry: ChiCTR-TRC-13003127), may provide more information about the safety of Tubridge implantation. Large aneurysms, especially those that are very large or giant, are more often associated with thrombus-induced mass effect or perianeurysm edema following flow diverter implantation. However, most of these complications are transient. Byrne et al24 reported 4 cases of worsening cranial nerve palsy or brain stem compression symptoms due to delayed aneurysm thrombosis and mass effect in 4 patients. Of these 4 patients, 3 recovered and 1 with a basilar artery aneurysm died. Berge et al19 reported that 15 patients presented with headaches that were associated with worsening symptoms; however, all of these symptoms were transient and eventually resolved. We also observed this phenomenon in 5 of our patients. However, all symptoms had resolved by the follow-up. Furthermore, we observed partial or complete improvement of the symptoms caused by mass effect in most of our patients, except for cases associated with badly damaged nerves. In our series, we observed excellent angiographic results after Tubridge implantation. During the mean follow-up period of 9.9 months, 18 aneurysms were completely occluded. The overall complete occlusion rate was 72%, which is comparable with those of silk flow diverters and the Pipeline Embolization Device and appears to be much better than those rates associated with conventional endovascular treatments.5,29,30 However, studies with a long-term follow-up and larger series are necessary. De Vries et al11recently reported their 6-month follow-up result, which showed a complete occlusion (94%), including 1 case with a 95%–100% occlusion. However, their research contained a high number of small aneurysms, which may influence the occlusion rate. There are still 6 improved aneurysms in our series with only a neck remnant observed. These will be followed up to determine whether they will finally be completely occlude. In this study, we listed the outcome of aneurysms treated with different modalities (Table 3). The FD-alone group seems to be comparable with the FD-plus coiling group; these results may raise doubts about the necessity of additional coils if there is no safety or delivery consideration as discussed above. However, the sample is small, and further study is needed to draw such conclusions. We acknowledge that the major limitations of this study include the relatively small series size, a short angiographic follow-up period, and lack of randomized comparisons with other potentially efficacious therapies. Patient-selection bias may also exist due to the strict inclusion criteria. However, the data suggest that the Tubridge flow diverter is a safe and effective tool for the treatment of large and giant ICA aneurysms. Another concern is the application of an antiplatelet regimen for flow diverters. An appropriate regimen should minimize the risk of thromboembolic events, while using as low a dose of antiplatelet drugs as possible to avoid of hemorrhagic complications. However, antiplatelet regimens still vary in the literatures; the dose, the intervals, and even the main drug used are different.11,13,18,19,23,24 Our regimen is modified according to our previous experience of intracranial stent placement, which still seems to be safe for Tubridge implantation. However, multicenter randomized trials with larger subject numbers and long-term follow-up studies are necessary. Our preliminary experience demonstrated that the Tubridge flow diverter is a safe and effective tool for the treatment of large and giant ICA aneurysms. However, multicenter randomized trials and long-term follow-up studies are necessary. Yu Zhou and Peng-Fei Yang contributed equally to this work. Disclosures: J.-M. Liu—RELATED: During the development, I gave some advice about the design of this device and offered some data about our previous hemodynamic studies. This work was supported by the Subproject of National Technology Supporting Program (2011BAI08B14), Logistics Scientific Research Project (BWS11C008), and the Science and Technology Commission of Shanghai Municipality (10441901902, 10DZ0510800). ClinicalTrials.gov. Multicenter Randomized Trial on Selective Endovascular Aneurysm Occlusion With Coils Versus Parent Vessel Reconstruction Using the SILK Flow Diverter (MARCO POLO Post-Market Clinical Investigation). http://www.clinicaltrials.gov/ct2/show/NCT01084681?term=Marco+Polo&rank=1. Accessed March 17, 2014. Accepted after revision February 3, 2014.